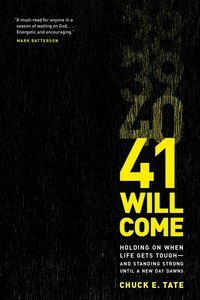 :A bold declaration of faith, 41 Will Come is a shot of encouragement and hope for everyone who desperately needs to hear ?God is with you. Your story is not over. You are not defeated.? Do you see the theme? Don?t quit. Don?t give up. Perhaps you're stuck in a downpour or lost in one of life's deserts. Maybe you're facing someone or something that could take you down. You might feel stuck on your journey, but 41 will come?it's on its way. No matter how long your battle?days, weeks, or years?Chuck Tate offers you seven keys to help you hang on to the promise and truth that God will come through for you.